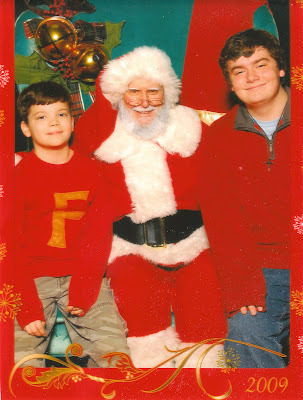 Yesterday I took the boys to the mall for their annual "Santa Picture". (WOW, was it a mad house of crowds!!!) Yes, they are wise to the Santa thing, but I have to have a picture so they deal with it. I frame these pictures & display them ALL together on the piano every Christmas. It's quite a walk down memory lane and fun to look at the boys growing and changing each year. I told Cole to wear something nice & Christmas-y....he wore his Halloween "Fart Face" shirt!!! Yes, it's red...but, but, but...it's stands for something so rude, crude & tacky!!! I started to take the big 'F' off, but he wanted it to stay. Sooo, for December the big F stands for Food, Fun, and Feliz Navidad! So There! While we were waiting in line & Ian sees some friends from High School. They stop & speak to us, laughing because we're in line to see Santa along with all these little kids. I told them they were afraid to join us because they knew they had been BAD and Santa wouldn't bring them anything. So there! So they laughed & went off into the crowd. A little while later it was our turn to see Santa. Ian & Cole sat down next to The Man, briefly chatted & said 'cheeeese' for the camera. Then Ian started turning red & laughing....his buddies were walking by again and had stopped to point & laugh! I told the photographer "quick, take another picture!" And now we have a picture to remember. Great story Donna. Cole is "Festivities-man"! The super hero of the Season. Nobody in the crowd knew what the "F" stood for so don't worry. You have great kids and that comes from being a great parent. 'Tis the Season for....concerts & fun!